Captured over the course of an eventful year in 23 countries, the film follows a chain of urgent human stories that stretches across the globe in countries including Afghanistan, Bangladesh, France, Greece, Germany, Iraq, Israel, Italy, Kenya, Mexico, and Turkey. 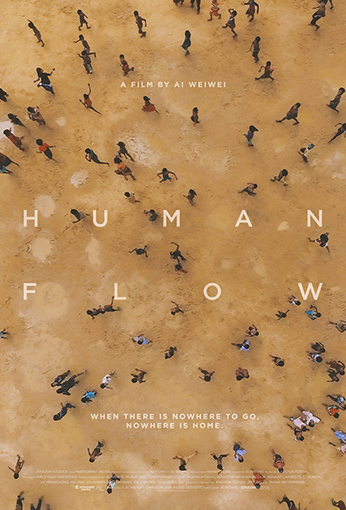 Human Flow is a witness to its subjects and their desperate search for safety, shelter and justice. From teeming refugee camps to perilous ocean crossings to barbed-wire borders; from dislocation and disillusionment to courage, endurance and adaptation; from the haunting lure of lives left behind to the unknown potential of the future. Human Flow comes at a crucial time when tolerance, compassion and trust are needed more than ever. This visceral work of cinema is a testament to the unassailable human spirit and poses one of the questions that will define this century: Will our global society emerge from fear, isolation, and self-interest and choose a path of openness, freedom, and respect for humanity?